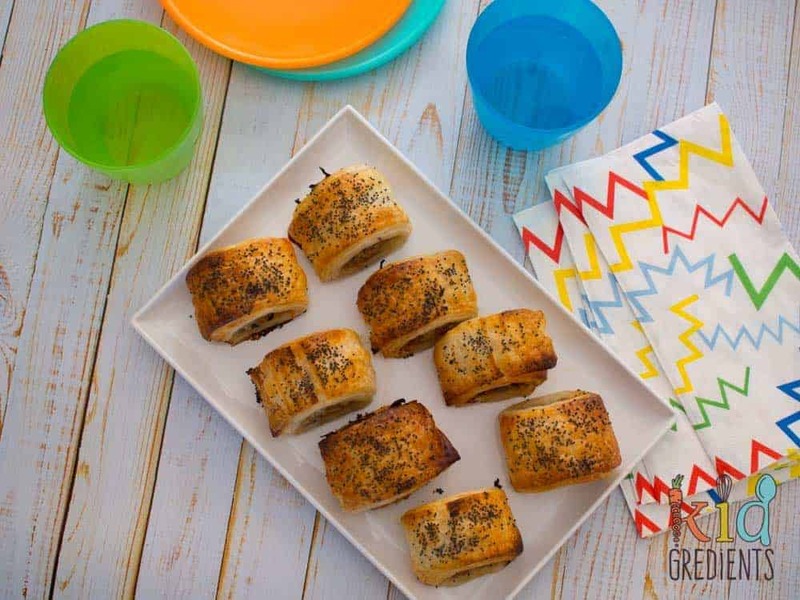 We love sausage rolls, they are the perfect party food, but I thought I would bring it up a notch and create another variety of healthy sausage rolls the kids will love! 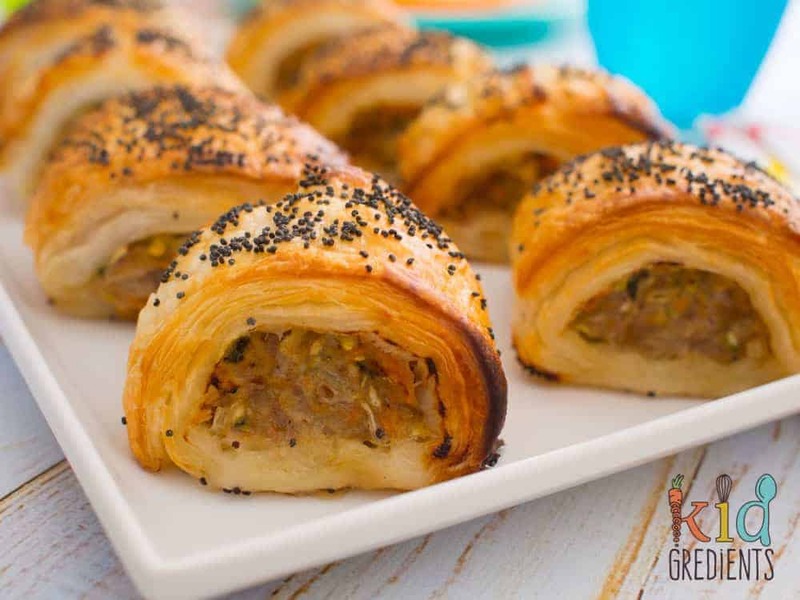 These Pork, apple and veggie sausage rolls are so yummy! They are basically reminiscent of a pork roast with apple sauce! is a party complete without a sausage roll? So September/October. Totally the busiest months for birthdays in our household. Within a fortnight there is Miss 6….Mr Kidgredients and also Master 4. So it’s busy busy around here. I like to get ahead and start the making, freezing and prepping before hand, because i like to have the parties at home. the apple makes the filling so moist! These are perfect for making in advance, I prep them all up to the baking stage and pop them on freezer trays in the freezer until frozen solid, then I move them to containers or freezer bags. Hopefully the ones I’ve got in there won’t be gobbled for a quick lunch before the parties…but when they taste this good, there’s no guarantees! Now, if you’re not a fan of poppy seeds…swap them! Use sesame or leave them plain…whatever floats your boat! 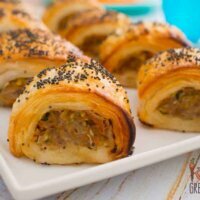 The only reason I’ve done poppy seeds is so I can distinguish between these ones and my original “Healthy” beef and veggie sausage rolls that honestly are one of my best ever performing posts. 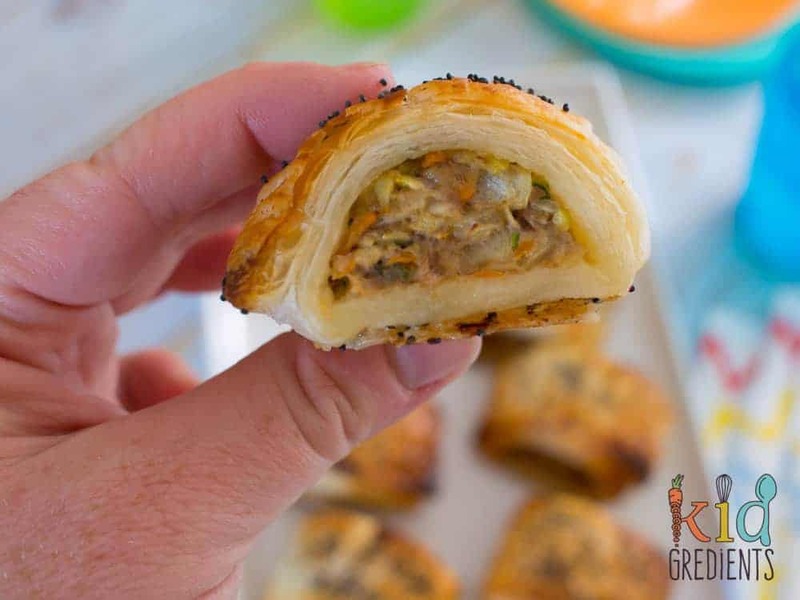 These pork, apple and veggie sausage rolls are so much yummier than any store bought sausage roll you could buy and cheaper too! So make your own, and taste how amazing they can be. 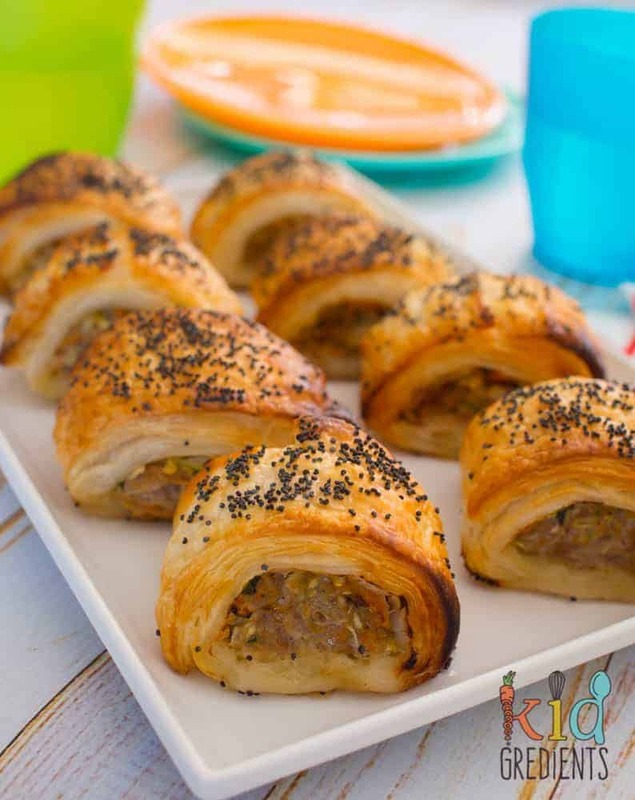 Pork, apple and veggie sausage rolls perfect as a party food and great to have in the freezer! So yummy and filled with hidden veggies. Easy recipe the kids will love. Take the pastry out of the freezer to defrost. Preheat oven to 220 degrees celsius (425 fahrenheit). Combine the filling ingredients in a bowl and mix well with your hands to combine. Divide the filling evenly between the six sheets of pastry and place along one edge. Roll it up to make a large pastry sausage. Cut each into 6 sausage rolls. Top with poppy seeds and bake at 220 degree (425 fahrenheit) for 20 minutes or until golden. You can freeze before baking on baking paper lined trays and pop in freezer bags or containers when full frozen. To cook from frozen: Brush with milk and top with poppy seed. Place in the oven then turn the oven to 220 degrees. When the oven arrives at temperature, cook the sausage rolls for 20 minutes more. Hey Becky, they were removed from the notes for some reason, but I’ve popped them back on!